The Beatles is undoubtedly the greatest and most influential band in the history of pop music. Along with revolutionary producer George Martin, ‘introduced the recording studio as an instrument’. Yet the first two Beatles albums, Please Please Me and With The Beatles, were recorded on very simple BTR two track machines; with the introduction of four-track machines in 1963 (the first 4-track Beatles recording was “I Want to Hold Your Hand”) there came a change in the way recordings were made—tracks could be built up layer by layer, encouraging experimentation in the multitrack recording process. This is a far cry from the unlimited tracks you are able to create on a laptop today. There were three separate recording sessions booked at Abbey Road, in which George Martin was there to record the baroque-style piano overdub onto “In My Life”. Martin initially tried a Hammond organ solo, but was unhappy with the results. He then attempted to play a part on a piano, but had difficulty playing the complex solo in time. Eventually he instructed engineer Stuart Eltham to slow down the tape to half speed, and played the solo an octave lower, so upon playback it gave the desired effect. Using the “varispeed” mode in Pro Tools’ elastic audio can perhaps yield similar results. As the Beatles pioneered the use of musique concrète in pop music (i.e. the sped-up tape loops in “Tomorrow Never Knows”), backward recordings came as a natural exponent of this experimentation. “Rain”, the first rock song featuring a backwards vocal (Lennon singing the first verse of the song), came about when Lennon (claiming the influence of marijuana) accidentally loaded a reel-to-reel tape of the song on his machine backwards and essentially liked what he heard so much he quickly had the reversed overdub. A quick follow-up was the reversed guitar on “I’m Only Sleeping”, which features a dual guitar solo by George Harrison played backwards. Harrison worked out a forward guitar part, learned to play the part in reverse, and recorded it backwards. Likewise, a backing track of reversed drums and cymbals made its way into the verses of “Strawberry Fields Forever”. The Beatles’ well-known use of reversed tapes led to rumours of backwards messages, including many that fueled the Paul is Dead urban myth. However, only “Rain” and “Free as a Bird” include intentional reversed lead vocal in Beatles songs. The stereo version of George Harrison’s “Blue Jay Way” (1967, Magical Mystery Tour) also includes backwards vocals, which is actually a backwards copy of the entire mix, including all instruments, which is faded up at the end of each phrase. Essentially every modern DAW has a reverse audio capability, but actually taking the time to write out the performance before the effect is applied will definitely result in something unique. In a 1968 interview, Martin recalled that he achieved this “by playing the Hammond organ myself and speeding it up”. In addition to Hammond organ, a 19th century steam organ was found for hire to enhance the carnival atmosphere effect. After a great deal of unsuccessful experimentation, Martin instructed recording engineer Geoff Emerick (as instructed by George Martin) to chop the tape into pieces with scissors, throw them up in the air, and re-assemble them at random. The resulting effect is quite unique, and fits in perfectly with the rest of the psychedelic Sgt. Pepper’s Lonely Hearts Club Band. This type of effect (if desired) is not only much easier to do in a modern DAW, it is certainly cheaper than mangling sought-after analog tape. The use of tea towels and other drum muffling techniques on multiple recordings are one of the big trade secrets of the Beatles. As early as 1962, Ringo can be seen using John’s Harmonica to dampen his snare drum. Whether it be how hard or light he hit a drum, a cigarette pack or wallet on his snare, masking tape or tea towels on a tom, creative mic placement or the type of mic used, the tightening, loosening or complete removal of a drumhead, the use of calfskin or mylar drumheads, etc. Ringo was a creative genius in the use of basic drum kits and getting the most out of them. It’s amazing. This list of techniques may seem ordinary by today’s standards but Ringo is the guy who knocked down the door in the recording studio with these simple and effective ideas. Using tea towels or other muffling devices can allow for more control over the volume, attack and decay of individual drums. Especially considering it was common for the engineers to apply extreme compression on Ringo’s kit with a Fairchild limiter, dampening the drums allowed for a tighter, more focused sound. Performing a song until the performance sounds the way the artist wants it to — what a concept! McCartney later said of recording the track, “When we were recording ‘Oh! Darling’ I came into the studios early every day for a week to sing it by myself because at first my voice was too clear. I wanted it to sound as though I’d been performing it on stage all week.” He would only try the song once each day, if it was not right he would wait until the next day. In order to make sure he got every precious first take right, McCartney would practice the song in the bathtub. He once lamented that “five years ago I could have done this in one take”. Artificial double tracking (ADT) was invented by Ken Townsend in 1966, during the recording of Revolver. With the advent of four-track recordings, it became possible to double track vocals whereby the performer sings along with his or her own previously recorded vocal. Phil McDonald, a member of the studio staff, recalled that Lennon did not really like singing a song twice – it was obviously important to sing exactly the same words with the same phrasing – and after a particularly trying evening of double tracking vocals, Townsend “had an idea” while driving home one evening hearing the sound of the car in front. ADT works by taking the original recording of a vocal part and duplicating it onto a second tape machine which has a variable speed control. The manipulation of the speed of the second machine during playback introduces a delay between the original vocal and the second recording of it, giving the effect of double tracking without having to sing the part twice. 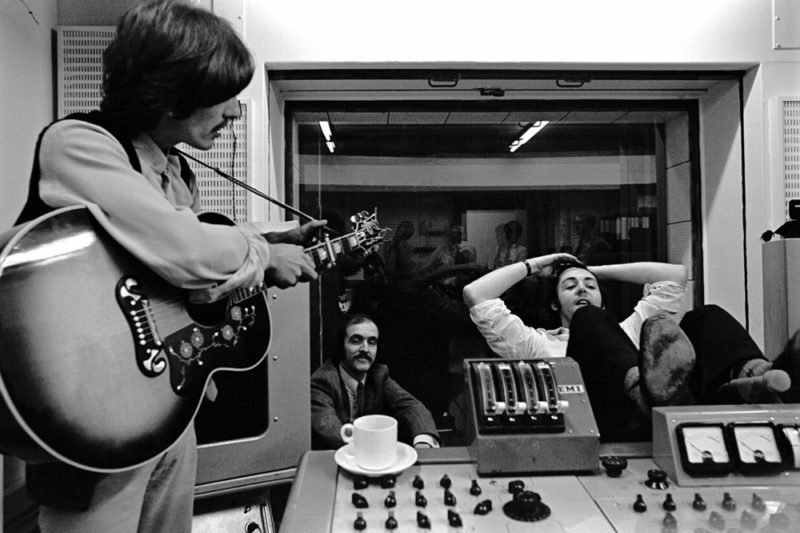 The effect had been created “accidentally” earlier, when recording “Yesterday”: loudspeakers were used to cue the string quartet and some of McCartney’s voice was recorded onto the string track, which can be heard on the final recording. It has been claimed that George Martin’s pseudoscientific explanation of ADT (“We take the original image and we split it through a double-bifurcated sploshing flange”) given to Lennon originated the phrase flanging in recording, as Lennon would refer to ADT as “Ken’s flanger”, although other sources claim the term originated from pressing a finger on the tape recorder’s tape supply reel (the flange) to make small adjustments to the phase of the copy relative to the original. ADT greatly influenced recording—virtually all the tracks on Revolver and Sgt. Pepper’s Lonely Hearts Club Band had the treatment and it is still widely used for instruments and voices. Nowadays, the effect is more often known as automatic double tracking. ADT can be heard on the lead guitar on “Here, There and Everywhere” and the vocals on “Eleanor Rigby” for example. The technique was used later by bands like the Grateful Dead and Iron Butterfly, amongst others. With today’s technology, you have pretty much carte blanche to create any music you want on your laptop, without even stepping into a recording studio. Your technology you have on your laptop is far more advanced than the recording studios the Beatles used in the 60’s.